Colt Cumpton, president of the American Junior Paint Horse Association, made it his presidential service project this year to travel the country to promote therapeutic horsemanship for wounded veterans and active military members. (To date, Colt has raised $9,227 for PATH International Equine Services for Heroes.) He was recently featured on KMBC News. Click here to watch the video. Thank you, Colt, for everything you have done on behalf of PATH Intl.! PATH Intl. Wins Equine Industry Vision Award! 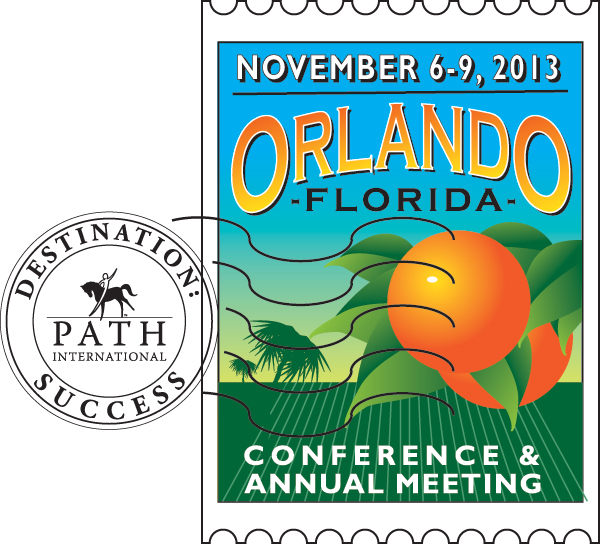 It is with great pleasure that we announce to our members that PATH Intl. is the recipient of the 12th annual Equine Industry Vision Award, presented by American Horse Publications and sponsored by Zoetis, formerly Pfizer Animal Health. The Equine Industry Vision Award Committee, which includes the AHP Board of Directors and a Zoetis representative, reviewed the record-breaking 21 nominations and announced PATH Intl. 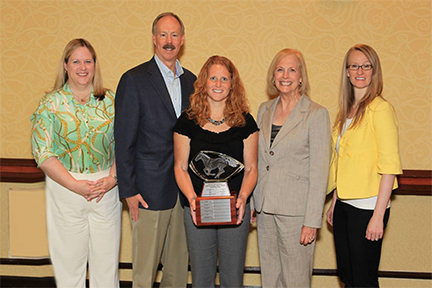 as the winner at AHP's Equine Industry Vision Award Breakfast on June 21, 2013. Finalists were judged on their performance in relation to the achievement(s) cited and their demonstration of the following attributes and abilities: 1) The vision and innovation of a true pioneer; 2) Leadership, commitment, dedication and willingness to serve; 3) Original and effective ideas and/or products, services, programs; 4) High moral, ethical and professional standards. The other finalists under consideration were Certified Horsemanship Association (CHA), KY; Tootie Bland, Owner and Producer of Road to the Horse, TX; and Intercollegiate Horse Show Association (IHSA), CT. Please check your email on Wednesday for a full announcement. The summer issue of PATH Intl. Strides has been mailed out! Polybagged with this issue is the much-anticipated 2013 PATH Intl. Conference Registration Book. In it, you will find the sessions schedule, hotel information, some fun things to do in Orlando, the Horse Expo line-up with the closing event at Arabian Nights and of course the registration form. Online registration opens July 9. We hope you will join us for Destination: Success! PATH Intl. Online Courses, including the CAT Course and Instructor Self-Study, have been updated to reflect the 2013 PATH Intl. Standards for Certification and Accreditation. If you are currently enrolled in an online course, you will need the 2013 Standards for Certification and Accreditation to complete the exams. The 2013 Standards for Certification and Accreditation is available to download for free on the My PATH Intl. Membership page. Click the orange box that says "My PATH Intl. Membership"
Filmmaker and videographer Ron Lawson has the opportunity to produce a program for EWTN (a global network that provides programming and news coverage for the Catholic church) on the content and ministries in the Catholic church that specialize in therapeutic horsemanship. He is hoping to talk with PATH Intl. Centers that have Catholic affiliations. If you would like to talk with Ron, please email him.